Nearly three years ago Butler Ford teamed up with Ford Motor Corporation to benefit local schools through the Ford “Drive One 4 UR School” program. The program offers students involved in sports or other extracurricular activities a chance to earn money for those activities by inviting friends and families to test drive a Ford on a particular day. For every qualified test drive Ford Motor Corporation donates $25. Schools have the opportunity to earn up to $8,000. Since 2009, every Spring and Fall, Butler Ford has partnered with Ashland or Phoenix High School to help bring in much needed funding for sports programs, bands, and clubs. Last year, we also helped the Ashland High School Grizzlies Football Team enter the Ford “Kick It and Pic It” contest which was open only to schools that had participated in Drive One events. Ashland won the $8,000 grand prize. Counting that contest, and the first ever Butler Ford “Drive One 4 UR Community” event held to benefit the “Southern Oregon CPR Initiative”, we are proud to announce that, with your help, Butler Ford has helped raise just shy of $60,000, for local students and community programs. Again, the next “Drive One” will be held Saturday, May 18, 2013. 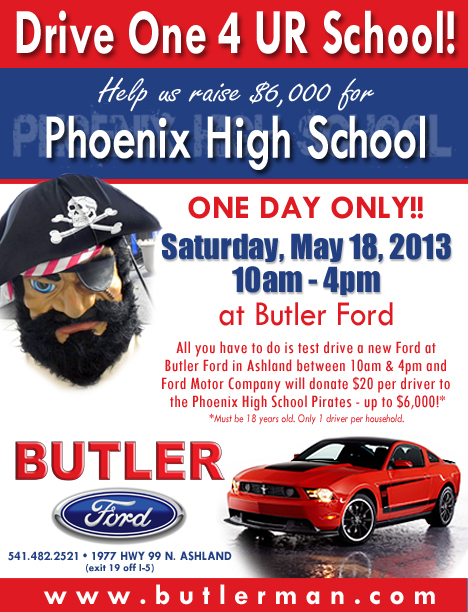 Come test drive a Ford to support sports and other extracurricular programs at Phoenix High! To learn more about the groups and organizations that benefit from Butler’s support click here.